If you’re a fussy eater who likes to know every ingredient that goes into your meal, this healthy soup is the perfect Singapore hawker dish for you. Every bowl of yong tau foo is custom-prepared with the diner choosing the ingredients and even the flavour of the broth. Yong tau foo: a healthy pick-and-mix meal. Common in hawker centres and foodcourts across Singapore as well as Malaysia, yong tau foo is a dish of South Chinese origins. Though the name literally means ‘stuffed tofu’, this is definitely not a vegetarian dish as the tofu pieces are stuffed with fish paste. Hollow vegetables like eggplant and chilli peppers are often stuffed with this fish paste, too. 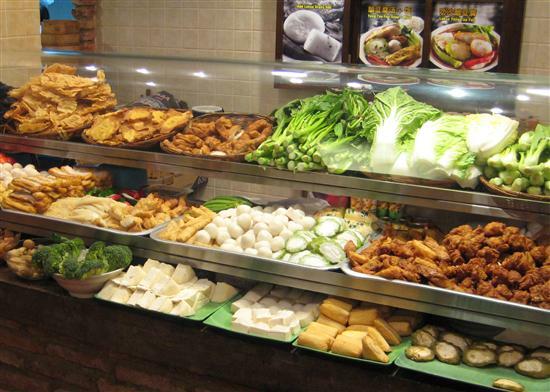 Yong tau foo stalls are easy to identify because they look like a bizarre salad bar. These are all the ingredients you can choose from to customise your bowl of yong tau foo and, other than the stuffed tofu and veggies, may include mushrooms, fish balls, broccoli, crab sticks, hotdogs and Chinese cabbage. At heartland hawker centres it’s taken for granted that you know what each item is, but at the foodcourts on Orchard Road they’re usually labelled in English. To order yong tau food, grab a bowl and use the tongs to select the ingredients you want. It’s usually priced by the piece (from S$0.30-0.50) and some stalls enforce a minimum number of pieces. Once you’re done, hand the bowl over to the hawker who will cut them into bite-sized pieces and cook them in boiling soup. The soup is usually a clear broth flavoured with chilli sauce, but for an extra S$0.50 or so at some stalls you can ‘upgrade’ to curry laksa broth or even Thai-style tom yam goong. For another S$0.50 you can add noodles to your soup or get a bowl of rice on the side. Yong tau foo is considered a healthy dish because it has lots of veggies and little oil (the complete opposite of char kway teow). Also, since it’s so customisable, you could eat it every day for a week without having the same dish twice.